There is something about this image that intrigues me. 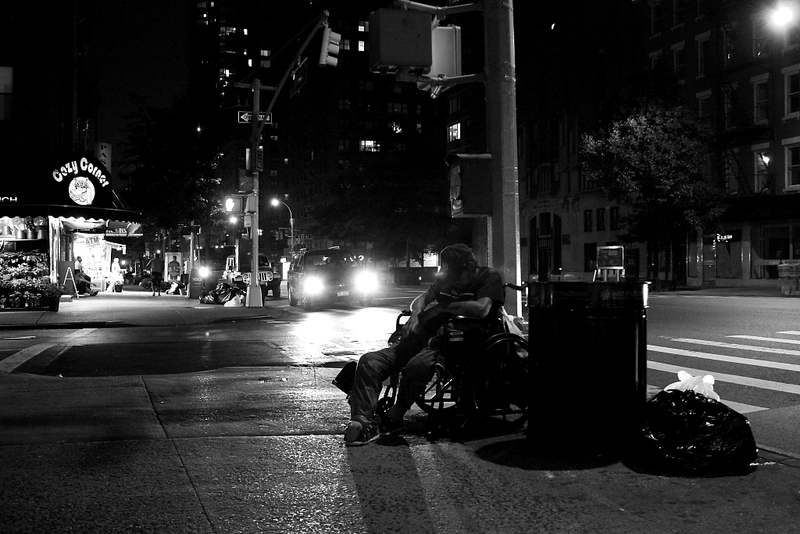 The subject sits alone and asleep in his wheelchair next to the trash on 61st and 2nd Avenue, Manhattan. On the other side of the street sits the ‘Cozy Corner’ grocery store, lit up like a beacon and obviously busy into the early hours. An odd but interesting balance I think. This guy is one of the unfortunate homeless of the city, I see him all the time on 2nd Avenue, this is my neighborhood and he is a part of it. I have a thousand if you want to listen …………. So gut-wrenching and sadly, the new normal.
. . . the odds are that he is a vet! It’s a sad situation for anyone, but even worse for many who have served, after which we have turned our backs on them. It does not seem to matter what you have done for your country, sadly. Homes fit for heroes , heroes fit for homes. He is, and part of the fabric that makes us what we are. No matter how sorry that makes us. I appreciate your kind nomination but I feel that because of the subject matter that I shoot, it would not be right to take something that is essentially theirs and not mine. You are very generous and I thank you for that. Thanks, I am out tonight so I guess I will see him again. Same place same scenario. My favorite kind of street photography – a story. Used to be my neighborhood too – 58th between Second and Third. Then you know the world I live in. Thank you for the comment. Fabulous photo if I may say so. I know the neighbourhood well and have noticed, hard not to, an increase in the number of homeless people. Is it more reassuring to see him all the time, that he manages to survive in this neighbourhood, or would his absence be of more concern? Lovely to think that “whatever happened to?” saw him safe, well and cared for off the street. Thank you so much for giving him his place in the neighbourhood. He deserves it! Keep up the good work! I guess in a strange way it is his home if that makes any sense considering his situation. Thanks for taking the time to comment. This is really a great photograph. Thanks for sharing it. Through this photograph, we see the humanity of the city. Your composition and use of light and dark points the viewer to the emphatic dehumanization of street people. However, you choose to make this man, someone you know by sight at least, the subject of the photo: someone worth noticing. It’s a terribly moving photograph. Thank you Mike. I really appreciate your comment. The contrast is great and the message is so strong in this image. Reality in our rich parts of the world is sometimes very sad, this excellent photo tells more than many words. Thanks, you are right …. More than words, sadly.